August 25, 2017. 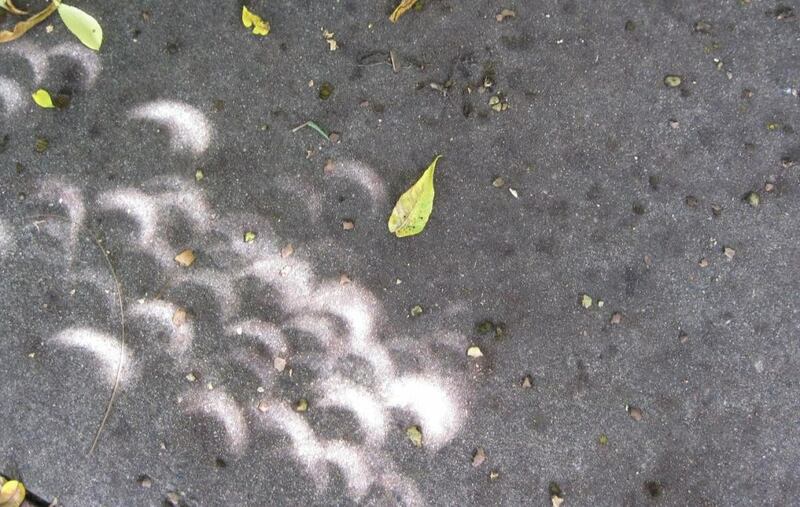 My wife took this picture last Monday in our back yard: the naturally-occuring “pinhole camera” effect that happens when the partially-eclipsed sun shines through tiny spaces between the leaves. For a moment, the ground was shining with crescents—a vivid reminder of our companionable star. I was struck, reading the news of the event, by how many stories reported on the reactions of animals: kangaroos at the Minnesota Zoo began grazing, as if twilight had begun; birds in the total eclipse zone went quiet; cows lay down in the fields. And of course human animals stood watching in rapt awe; many of them had driven hundreds of miles to do so. August 15, 2017. This past month I was in Chicago and had a chance to visit one of my favorite institutions, the Field Museum of Natural History. I was especially eager to visit an exhibit entitled “Specimens,” a fascinating overview of the museum’s role in collecting, organizing and safeguarding over 30 million biological, geological, anthropological and zoological specimens. The exhibit was designed to explain that, although fewer than 0.1 percent of these specimens are ever exhibited to the public, they play a vital role in the ongoing expansion of our scientific understanding of the natural world. With this story, the exhibit did something unusual: it foregrounded the lives of specimen collectors themselves—those who travel the world, often in difficult conditions, to identify and bring to the museum the bewildering variety of animals, plants, rocks and artifacts that are stored in its archives. One collector in particular caught my attention: Harry G. Nelson, who spent his entire life collecting tiny dryopoid riffle beetles for the museum. Five hundred and twenty-five thousand riffle beetle specimens, to be exact. There was a full-size photo of Nelson in his lab—an elderly man with a silver beard and ponytail, wearing the Pendleton shirt and wide-wale, high-waisted corduroys of a field scientist. Behind him was an enormous map of the Great Lakes region speckled with red paper dots; under his hands was a similar map. In addition to the myriad of boxes and jars of dryopoid beetles, this was Nelson’s other great contribution to science: bestickered wall maps. 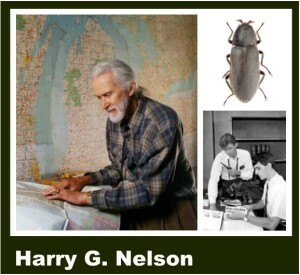 Over the length of his career he visited more than 6,000 streams in the upper Midwest and Canada—making careful notes of water conditions and of the presence or absence of riffle beetles. This care and detail would prove useful in ways he could not have predicted. Riffle beetles are tiny beetles that live at the bottom of streams and feed on algae. Unlike other water beetles, they do not surface to breath—they extract oxygen osmotically through an air bubble called a “plastron,” which they surround themselves with when they first enter the stream as adults and which they maintain all their lives as a kind of natural diving suit. 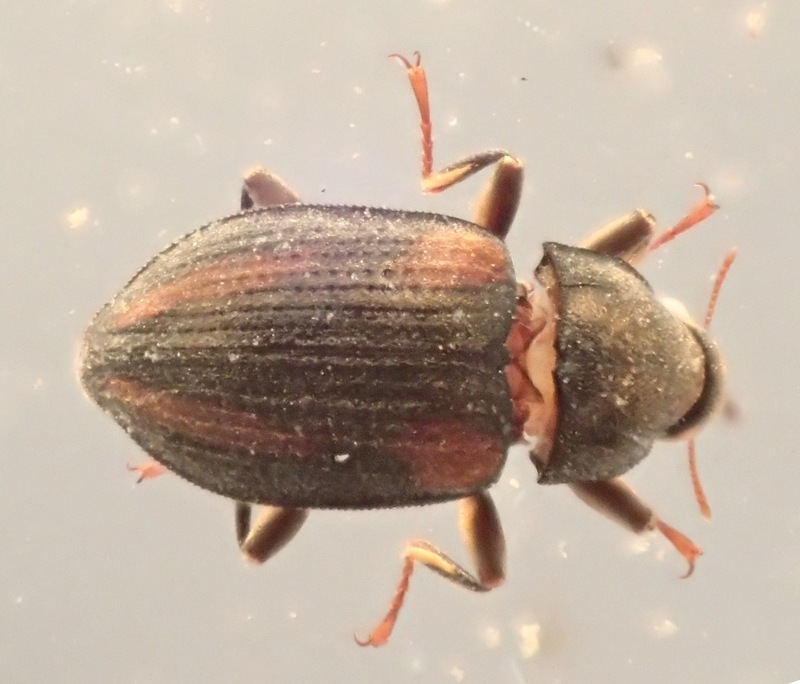 Because of their unusual method of respiration, riffle beetles can only live in cold, oxygen-rich, and clean water: their presence or absence in a stream is therefore a good indicator of water quality. The power of Nelson’s maps therefore goes beyond merely describing the population distribution of an obscure, tiny insect—they are benchmarks of stream health throughout a vast swath of the country. 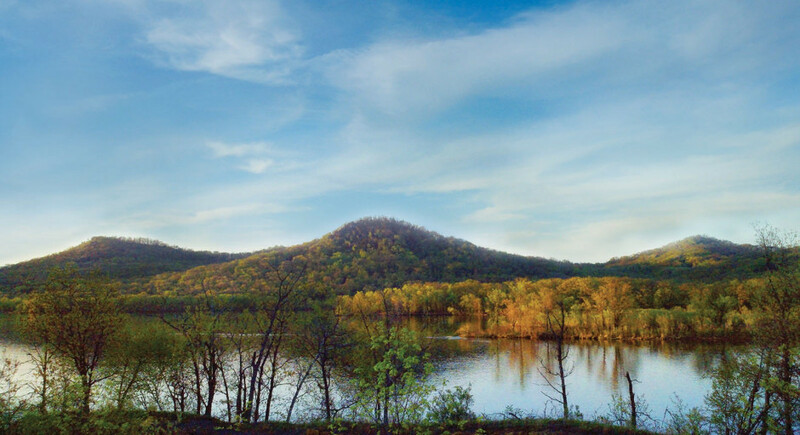 I was deeply moved by the patient work of a man who, with unflagging zeal, waded through thousands of cold Midwestern brooks and streams and rivers—no doubt swatting mosquitoes and black flies as he wielded his net and collecting bottles. When we think of science we often think of transformative figures like Darwin or Pasteur or Einstein—figures whose theories have changed the way we perceive the world. But such scientific giants only exist because of the vast body of data collected, evaluated, and catalogued by foot soldiers like Nelson. And whereas it is easy to see why it would be thrilling to be Darwin, we don’t perhaps quite appreciate why it would be important to be Nelson—or why it might be satisfying. Nelson worked without knowing what good would come of his efforts. He no doubt felt the pleasure and excitement of the process itself—the opportunity to spend his days in the field, clomping through the bush in hip waders, carefully searching the riffles of streams for a tiny beetle whose life he became so intimately entangled with. But he also worked in the faith that the ongoing project of science was bigger than he was, something that had cumulative power. August 5, 2017. It seems eons ago that I and ten thousand others walked from the St. Paul Cathedral to our state’s capital in St. Paul. 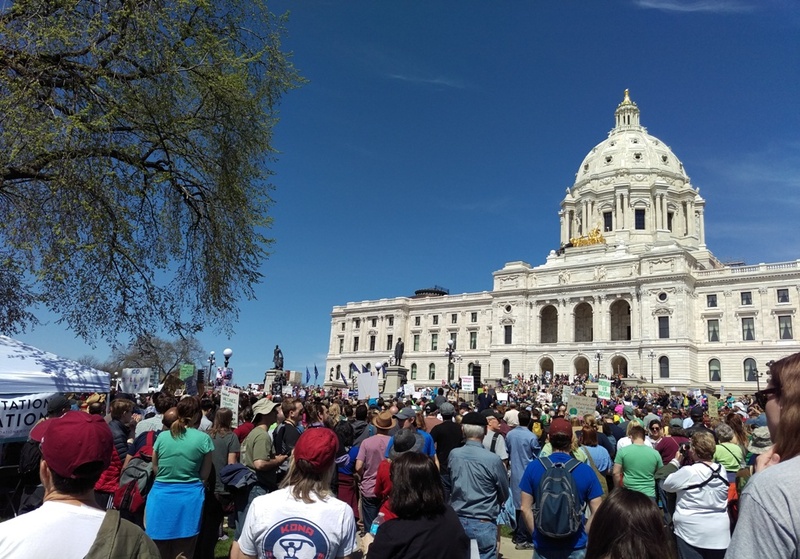 It was Earth Day, 2017, and a massive slice of the Twin Cities elite hell-bent for leather on the destruction of our society (to hear it told by right-wing talk radio hosts), decided to go against their personality type and let it be known that they were on a March for Science. I don’t know how many of them there that day had been in a protest march before, but if they were like me, the answer would be few, if any. Protest march is a little strong. It was after all, a march for something, not against something. Although as we walked down Summit Avenue to the gathering place at the cathedral, a jovial Fortune 500 type striding in jaunty, manly fashion down his mansion walk, with his voluminous family in tow, shouted to use from his front steps—“Down with science!” Of course, we all laughed, knowing he was making a joke. But at the same time, how did he know? How did he know that we highly educated few had become an easy object of scorn by a substantial segment of the voting public? Perhaps gut instinct led him to that knowledge, as with all good executives governed by their abdominal workings. Yes, there were the caricatures of President Trump as the enemy of reason, a climate denier, and statements like, “You can’t have opinions about facts.” My liberal friends surrounding me pulled all the little shibboleths and stock phrases out of their kit bag to expose the foolishness of the anti-science crowd. It was all there on display to either warm the cockles of your heart, or make you shake your head. 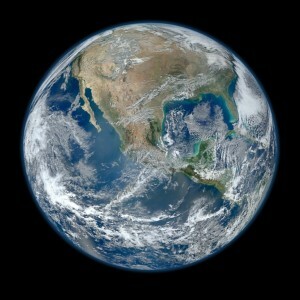 An iconic Blue Marble shot of North America by Norman Kuring, 2012, courtesy of NASA and its Suomi satellite. The original Blue Marble shot was first taken in 1972 by the crew of the Apollo 17 spacecraft. The March for Science on Earth Day, 2017, brought out millions of scientists around the country who have cultivated a habit of making reasoned judgments based on facts and subject to the critique of other scientists. At this moment in our nation’s unfolding story, though, it seemed important to these millions to draw attention to something. One sign at the event summed things up nicely. “When the introverts are marching, something is wrong.” That’s the truth. Those people crowding around me, wearing t-shirts with “e=mc2” or the face of Bill Nigh the science guy, or Einstein, and carrying signs that a scientist would find amusing, like—“Empiricism now!”—these people would like nothing better than to stay in their laboratories, or walk their field plots, or take their lake sediment cores, and measure their atmospheric gas levels using a weather balloon—they’d like nothing better than to do these things, publish their papers, go to conferences, and be left alone. At this moment, though, they all sense something seismic had shifted in the cultural landscape, and that’s why they were here. What was that shift that they sensed which drew them into the sunshine of a beautiful spring morning with fellow eggheads and science geeks? Maybe it started in the 1990s when science got caught up in the culture wars, a time when conservative think tanks and far right talk shows were changing the landscape of public discourse. What the marchers all around me sensed happening was that a determined group of people were trying to erode the faith that people put in scientists to tell the truth, or as much truth as can be told given the world’s complexity and our meager capacity to see, hear, and understand how it all works. Those culture wars, as many have pointed out, had their roots in opposition to the secularization and liberalization of our society, made visible in periodic skirmishes over tenets of Christianity as practiced by certain groups, and the scientific method. The Scopes monkey trial of 1925, for example, pitting godless Darwinism against the Bible’s seven day creation, is a classic case. Let’s just say that this long-running altercation goes back centuries, and in our country, most obviously to 1909 when fundamentalist preachers and businessmen made their case for Christianity and against Darwinism in “The Fundamentals: A Testimony to the Truth”. Flash forward to the 1960s and ’70s and the enactment of laws that used scientific information to address urgent environmental issues. 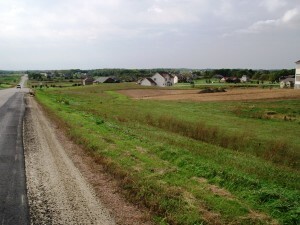 Those laws made rivers and lakes clean enough to swim and fish in; established sulfur dioxide emissions trading which eliminated smog that hurt the elderly, children and asthmatics; protected drinking water from dumped industrial chemicals; eliminated lead in gas and paint which effectively raised the IQs of urban children by several points; prompted an international ban on the chlorofluorocarbons damaging the ozone layer—a natural shield against cancer-causing solar radiation…I could go on, but you’d be happier if I didn’t. Those actions affected business people who, already in the 1960s, had set their gun sights on what they believed was stultifying their earnings—high corporate income tax, personal income tax on high earners, laws favoring unions and opposing monopolies, restraints on international trade, and restraints on ingenious financial arrangements. To this laundry list of economic burdens was added “over-regulation”. Emboldened by the triumph in 1991 of a capitalist economic model over the Soviet’s extreme and incompetent socialist model, they mounted a full-court press in the 1990s and have pressed on vigorously to this day. Businessmen paid scientists willing to skew or selectively use data, and supported outspoken individuals who were only too happy to bring worthy environmental laws under the umbrella of over-reach and over-regulation by a government intent on constraining liberty. Most Americans still believe scientists mostly act in the public interest, but a solidifying group of voters and the people they elect increasingly do not. Pew Research Center poll, April 2017. Calls for climate change action only made it worse. Most of the oil and gas industry, and companies dependent on fossil fuels but unable to see a path forward to other energy sources, opposed investment in alternative ways to power America’s industries, electrical grid, and transportation network, and any move away from fossil fuels. Conservative think tanks, conservative talk show hosts, and certain chambers of commerce carried the banner. Despite the sometimes distant effects of climate change (it will be a few decades before sea level rise combined with storms bankrupts the insurance industry), it is not a bad thing to shift to renewables. After all, they represent cutting edge technology, their future aims toward cheap and low-polluting energy production, and they will eliminate entanglements with oil-producing countries opposed to an open, democratic society, like Russia, Venezuela, and most Middle East nations. One telling example of how science is made suspect for millions occurred in a Rush Limbaugh session where Rush questioned NASA research about a former ocean on Mars. Evidence for water on Mars, including once vast amounts of surface water, is pretty convincing. There remains on Mars enough frozen water to cover the planet. Rush’s incisive rebuttal to the claim of a lost ocean was, “How do they know that! ?” He accused NASA of falsely alarming us by saying runaway climate change will eliminate water on Earth as it did on Mars. 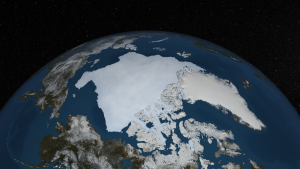 He went on…“They’re just making up the amount of ice in the North and South Poles, they’re making up the temperatures, they’re lying and making up false charts and so forth. So what’s to stop them from making up something that happened on Mars that will help advance their left-wing agenda on this planet?” Yes, the question is still open as to whether the hypothesis of a Mars ocean is irrefutably true, which is what separates science from belief or bluster dedicated to a single truth. Given the weight of evidence, though, it’s reasonable to assume there was an ocean on Mars, but you’d have to read the evidence yourself to know for certain. On the other hand, all Rush has to do to convince his millions of listeners—and everyone continuing the conversation at kitchen tables, Main Street cafés, churches and social gatherings—is to say “How do they know that! ?” and all is suspect. He and his like, including past and present authoritarian regimes, know that repeating a falsehood thousands of times can shift public opinion. One event in particular is a textbook example of how the impartiality of the scientific process and motives of scientists are called into question. In what some call Climategate, a hacker stole emails from the University of East Anglia, a climate change research center. The head researcher there, Phil Jones, was trying to combine a graph of tree growth rates with temperature measured by thermometers. Tree growth data and temperatures are correlated—warmer temperature produces wider annual growth rings because the growing season is longer and trees can lay down more cells in that period, thickening the annual growth rings. Cooler periods produce narrower annual growth rings. From 1880 to 1960, tree ring width largely followed temperature swings. Since 1960, however, tree growth has slowed while temperatures have gone up. Scientists in the field all know this—it is no secret (see https://en.wikipedia.org/wiki/Divergence_problem). Going farther back, historical tree ring data matches other temperature indicators, like ice cores, quite well, and so it is a reasonable proxy for prehistoric and modern temperatures—until 1960. In one of the hacked emails, Phil Jones told a colleague how he was going to present in a graph the recent divergence between measured temperatures and tree ring data. If you want to read this yourself, go to https://www.skepticalscience.com/Mikes-Nature-trick-hide-the-decline.htm. 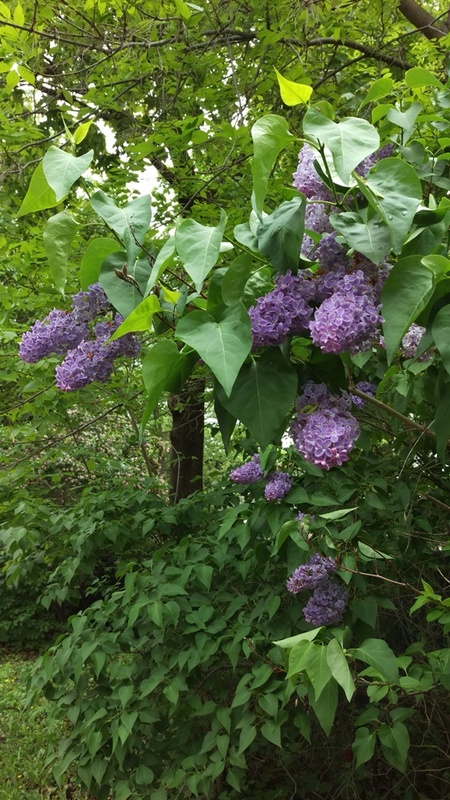 In once sentence he said he’d use a statistical “trick”—not a trick at all, just his colloquial expression for a statistical tactic—which ended in the phrase “to hide the decline,” meaning the decline in tree growth rates. Recipients of the hacked emails revised the sentence to show nefarious intent: “a trick to hide the temperature decline”. Those words were not what the email said, but they were picked up verbatim and spread widely. The scientists were found blameless in subsequent investigations in the United States and Britain (see the Wikipedia entry on this, at https://en.wikipedia.org/wiki/Climatic_Research_Unit_email_controversy). 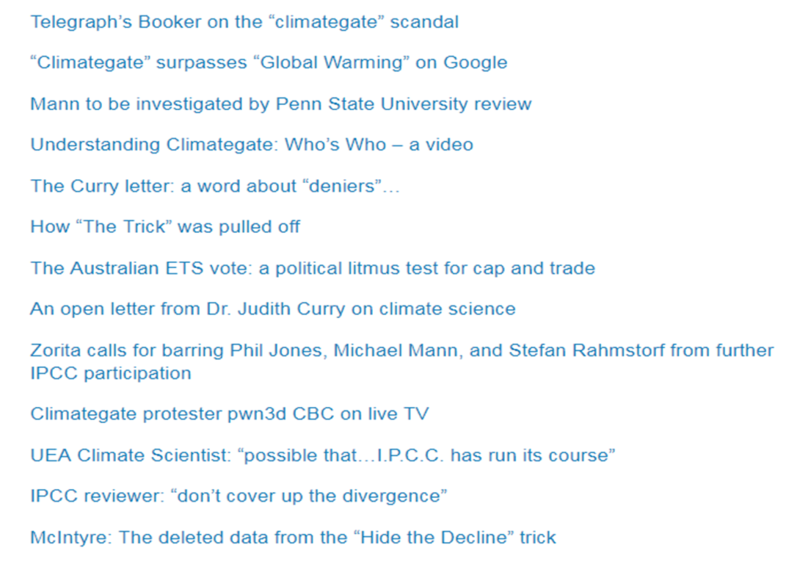 Screenshot of a climate change skeptic’s website–with links to topics fanning the flames of false controversy. For many, however, this was the smoking gun which proved that climate change was a hoax concocted by scientists intent on chaining American industry and its people to a poverty-stricken and limited future. Nobody need look at evidence, nobody need balance the evidence and reach their own conclusion. Climate change skeptics found the evidence, disseminated it widely, and for many it is now indisputable. Some of my relatives cite this moment to reject the entire concept of climate change. 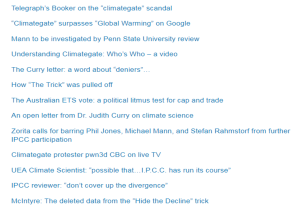 For them Climategate is a foundational truth propping up other evidence they’ve gathered from Internet sources, many supported by some in the fossil fuel industry and by conservative funders. That version of climate science seeks to refute the evidence that rising atmospheric carbon dioxide is paired with increases in temperature and water vapor, which is linked to certain unfortunate weather events around the globe, and that people are in part responsible and will experience economic and emotional harm that will increase over time. The problem is that few have the time, patience or background to understand what really happened. The science has advanced to a point where ordinary people cannot engage with it. Just reading the Wikipedia entry about“Water on Mars” would take an ordinary person an hour. More urgently, there’s so much technical background you’d have to accumulate over a lifetime to grasp most of the concepts, it is just hard to understand. This is a problem for our society. The cultural-economic-techno bubble we’ve created to insulate ourselves against the ups-and-downs of the natural world is now so complicated that it takes a legion of experts to understand, operate and maintain it. Think of the economic system we’ve created—it’s no longer Joe trading Jane one sheep for two bags of wheat, like in the Settlers of Catan. It’s now about derivatives and futures and mortgage-backed securities and annuities and hundreds of other financial instruments, as they are called, to make and grow money. Medicine is becoming more complicated as we dig into the cellular, molecular, and genetic basis of biological function, and manipulate the body at the level of atoms, using tiny robots we create from atoms. We plow our fields and apply our fertilizers and pesticides using lasers, GPS systems, and computers. Hardly anybody can work on a car anymore—you can change tires, brake pads, oil and filters, but that’s about it. Science is where our life-supporting technology starts. Science is the demon and savior at the same time. I suspect this is what my fellow Americans are unconsciously reacting to. No one person can understand it anymore. Leonardo da Vinci may have been the last to master all the sciences. The lay people who practiced science regularly lived in the 1700s, holding science parties on a Saturday night, playing with nitrous oxide which dentists now give you to relax. Fun was had with the repelling power of magnets, in extinguishing candles by pumping the air from glass bell jars, or with any number of interesting experiments done in the home. I was just at an exhibit at the Minneapolis Institute of Arts—an 18th century Science Salon could have taken place in the room where we stood. It looked so quaint, the various mechanisms and objects of science in an ordinary sitting room of the day. Imagine people like you and me doing science experiments at home on a Sunday afternoon, entertaining ourselves and guests. The closest thing to that now is the High School science fair with volcanoes made of vinegar and baking soda—no longer an award-winner , with top honors instead going to statistical tests of product performance or experiments with light refraction and wavelength detection. On an emotional level, we have 95 percent of the country’s population who are not science people being bounced around inside this cultural-economic-techno bubble we’ve created and hardly understanding anything about it. “Why am I getting jerked around all the time?” they ask their neighbors. And then you have someone tell them that regulations scientists spawn with their so-called research findings are in fact in service of socialism, or crushing America’s entrepreneurial spirit, or just born of a gleeful petulance to control the world—you come to believe science is a humbug, to corrupt a phrase from Ebenezer Scrooge. 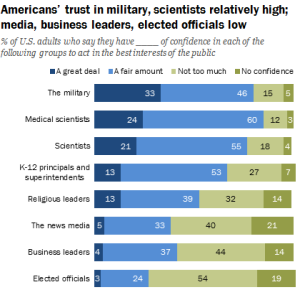 Now we have the science wars come to a head with the election in 2010 of an anti-science group in Congress and then an anti-science president in 2016 (or perhaps these groups are anti-science to the extent it benefits them politically). Ergo…the Science March. This and all the rest I touched on here is the seismic shift scientists sense has occurred, and they decided to march. July 1, 2017. 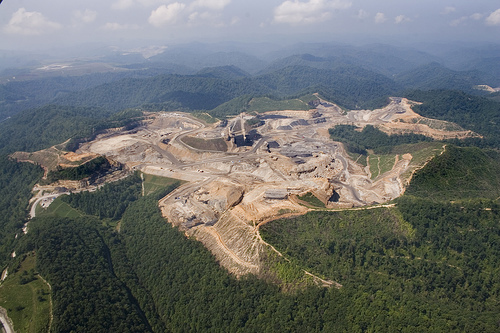 Among the many dramatic yet predictable executive orders in the first several weeks of the Trump Administration was this one: allow coal companies to again sidestep the intent of the 1972 Clean Water Act and let acid water from coal mining continue to damage Appalachian streams. 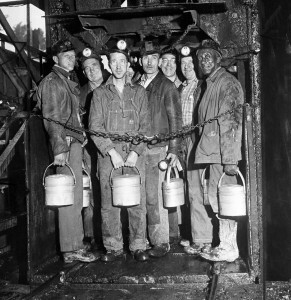 Something intended to help the miners—the return of jobs to an industry suffering from a long downturn—will not come to pass and, tragically, the executive order will only bring more sorrow to the mining towns of West Virginia, Pennsylvania and Kentucky. How is this possible? We have to reach back into the history of coal mining to understand. 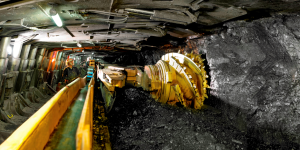 It used to be mainly an underground operation—vertical shafts going down to reach the coal seams, and horizontal shafts following the seams wherever they might lead until it was no longer economical to dig that seam. In the 1960s coal companies also began removing the tops of mountains that had coal in them using massive earth-moving equipment, piling the mountaintops in nearby stream valleys, and digging the coal out with a front-end loader the size of a small house. This reduced costs because you needed fewer coal miners, making it more profitable to mine coal. 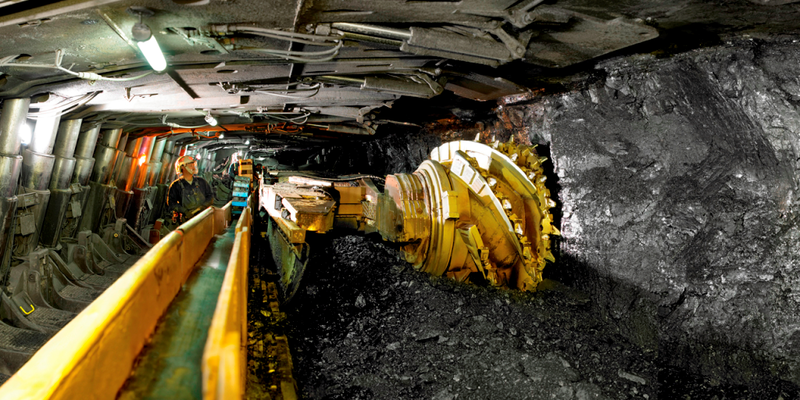 Meanwhile, in mines still underground, mining continued its march toward greater efficiency through mechanization, and also dumped its rock spoil in valleys. Aside from the wholesale removal of mountaintops, which, as you can imagine has a few unattractive aspects, the rock around many coal seams is laced with pyrite, a sulfur-bearing rock. When rain hits that rock, the pyrite transforms the rain from a neutral liquid, like tap water, to an acid able to damage living tissue. This shouldn’t be a surprise since we all were cautioned about sulfuric acid in our high school chemistry class. 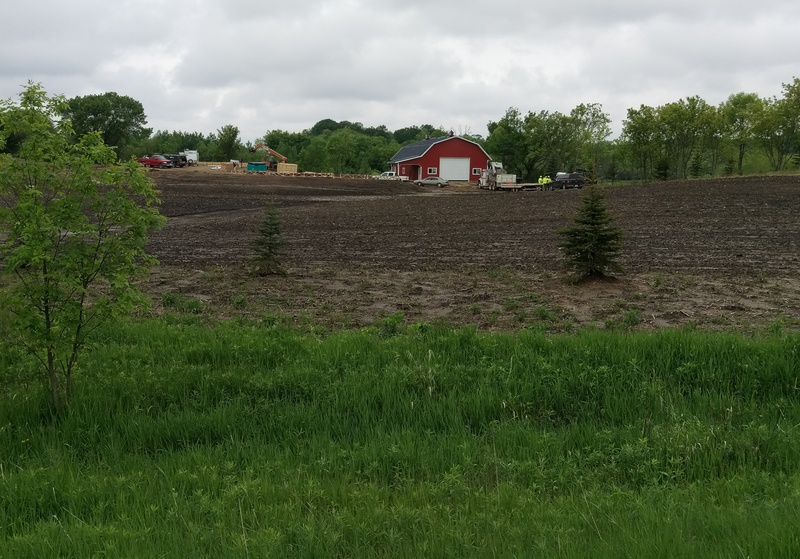 Underground mining has its own drawbacks, too—undermining foundations and affecting water flow in streams. Both mountaintop and underground mining can damage streams by making them acid with the rock rubble they place in valleys. You can see the effect of stream acidification on aerial photographs from the mining districts. Orange streaks in valleys are acidified streams. There aren’t too many species on the planet that can survive in acid water…bacteria like those in Yellowstone’s hot springs, maybe…but no snails, no clams, no dragonfly or mayfly larvae, few if any fish—none of that. All those things disappear and you are left with a largely lifeless orange slash on the landscape. 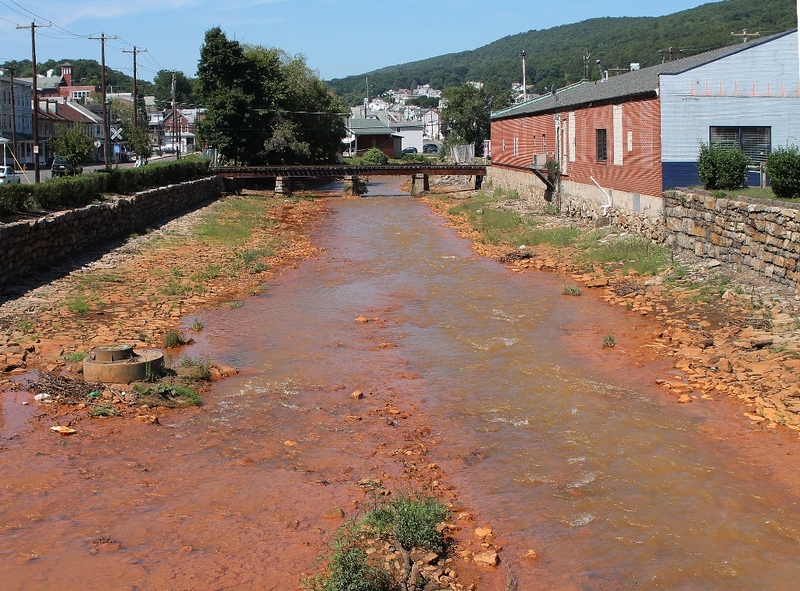 The orange coating on stream bottoms and banks is a side effect, when iron dissolved in a stream coalesces, settles, and attaches to stream banks and rocks. Bottom-dwelling insects, the base of stream food chains, can’t tolerate the conditions. Having such a stream in one’s backyard can’t be a good thing. 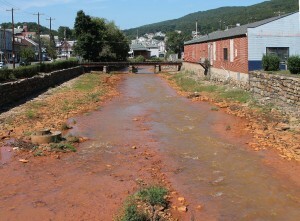 Orange-tinted Shamokin Creek, Pennsylvania. Upstream mining acidified the water, causing dissolved iron to coalesce and coat the rocks and stream bottom. Photo Jake C 2014. 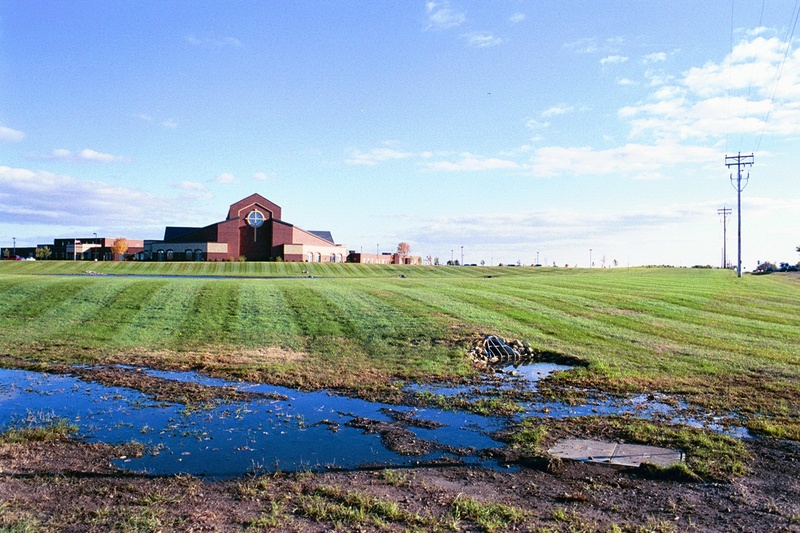 Since its inception the Environmental Protection Agency, as part of its charge to enforce the Clean Water Act, has developed rules to explain how the law was going apply to specific situations, like mining. These rules would direct mining companies, for instance, to stop dumping acid-creating rock rubble into streams and to prevent acid runoff leaching into them. To do that one has to build a containment pond, or tailings basin, and treat the water to reduce its acidity. Of course the mining companies hated that because it cost money, and mining, like landfills and any industry done in bulk, deals in profits of pennies per ton. Many, many tons must be sold to pay for a tailings basin that won’t acidify a stream. Despite having the legal authority to do so, the Environmental Protection Agency never got around to finalizing the rules until the Obama administration, and did so in the last moments of his second term. One of the Trump administration’s first acts was to retract that EPA rule so coal companies could continue to pile acidic rock in streams or discharge acid water directly into them. The damage to the environment is, yes, something to be upset about, but what seems more tragic to me is the human drama playing out. Some coal miners must suspect that allowing coal companies to acidify streams in their own back yards won’t bring the jobs back. But for the moment that straw of eliminating regulations is the only thing within their grasp. 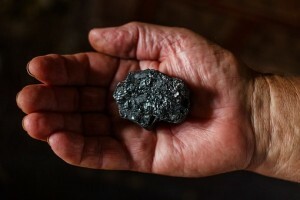 They know that coal is up against stiff competition from other ways of getting energy. Coal’s biggest enemy, natural gas, emits far less carbon per megawatt hour generated, requires cheaper pollution control devices at the smokestack, is easier to transport, requires no large storage areas, and at the moment is about the same price per megawatt hour as coal. Power companies across the country are tearing down their coal-fired power plants and installing natural gas energy production facilities. I watched the demolition of one of them several years ago in St. Paul. The massive facility, towering black piles of coal, and a 250 foot tall smokestack are all gone. Instead there is a compact, low-slung building with two squat smokestacks. All the extra ground has been turned into a park with a bike path. Meanwhile, solar and wind powered energy continue to be produced at ever-lower costs, predicted to be cheaper than coal in the next several years. The idea that coal companies will share with workers the small savings they get from not having to properly manage their acid runoff is a pipe dream. Likewise, coal companies will do their best to avoid hiring new workers if they can increase production by increasing efficiency. No company in America, except ones owned by employees, would turn a windfall back to workers. That windfall will go to dividends for shareholders, bonuses for top managers, investment in automation (because labor is the biggest cost in every business), and cash reserves to bolster the stock price. That is the natural way of capitalism, as Thomas Piketty pointed out with his equation, r > g. (The rate of capital growth is always greater than the rate of growth of the economy—in other words, owners of invested capital get ahead much faster than those who earn their living by wages.) The income gap grows because the owners reward themselves first, and everybody else, if there’s anything left, gets what’s left. 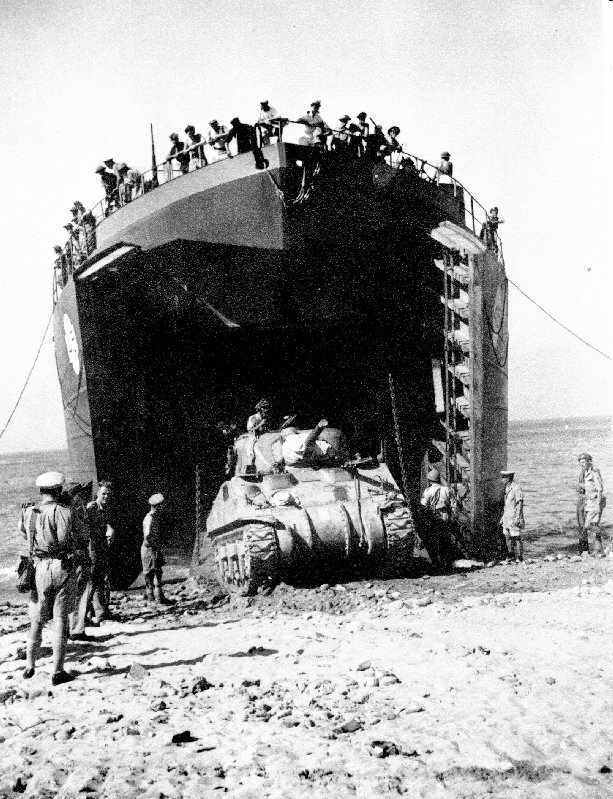 In Army-speak, this is a Landing Ship, Tank (LST) which helped win World War II, disgorging a tank. This one landed in Sicily in 1943. Photographer unknown. June 7, 2017 (Winona Daily News). Over Memorial Day weekend I watched “The Longest Day,” the 1962 film about the Allied invasion of Normandy in World War II. I was interested in seeing it because I have recently been revisiting my grandfather’s role in the event. He was not a soldier: he was a crane operator at the Evansville Shipyard on the Ohio River, which was put in place in just a few months in 1942 specifically to make Landing Ship Tank (LST) transports. 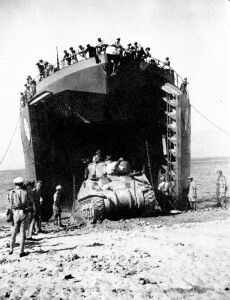 LSTs were crucial to the war because they were able to land troops and vehicles on beaches, thanks to their innovative bow design. The Evansville Shipyard was an example of the industrial organization that stood behind the Allied victory: as soon as America entered the war, virtually the entire economy was converted to the single purpose of defeating the Axis powers by turning out arms and materiel for the battlefield. The Evansville Shipyard converted a heretofore rather sleepy Indiana town into a major naval facility that, at its height, turned out two 300-foot ocean-going vessels per week. It employed 20,000 people, both men and women. Nor was that the only production facility in Evansville: my grandmother worked in a factory that had been converted to make P-47 Thunderbolt fighter planes, and my great-grandfather worked in the Chrysler plant that had retooled to make 45 caliber ammunition. The overall population of Evansville swelled from 21,000 to 64,000 people almost overnight as people from all over the region flooded into the city for war work. The effect on my family was immediate as well: many of them were finally able to buy houses (and in my grandfather’s case, a farm) and thus were pulled out of the cycle of poverty that afflicted so many working people in the first half of the 20th century. It is an oft-cited fact that the coordinated industrial efforts of World War II ended the Great Depression, and this was certainly true for my relatives. I mention all this because on June 1 Donald Trump announced he would withdraw America from the Paris Climate Accord, claiming it was a “bad deal” for American workers. He cited questionable statistics (derived from highly disputed reports) that claimed any effort to fight global warming by decarbonizing the economy would put Americans out of work and transfer wealth from the U.S. to the rest of the world. This decision was in line with his “America First” agenda. A clever graphic designer slipped the iconic tower into a leaf shape as the logo for the 2015 UN Climate Change Conference in Paris. It appears a leaf-eating insect has embellished the design, but what the divot means is unclear. Many of the same arguments were of course made against entering World War II — in fact, Trump’s slogan “America First” is derived (via Pat Buchanan) from the anti-war movement of that time. But Pearl Harbor changed all that, and the net result of America’s militarization was the material prosperity that characterized the 1950s and 1960s—nostalgia for which obsesses Trump and his voters. As the sole standing industrial power after the war, America was bound to prosper; but the sense of shared sacrifice that characterized the “Greatest Generation” was also a factor. That shared sacrifice is exactly what is missing in our recent wars, which are fought by a tiny minority of Americans and are paid for by debt. It is important to remember that the tax rate on upper incomes during World War II was 94 percent. Trump ran on a populist economic platform and then quickly betrayed it as soon as he entered the White House — bringing in the same Wall Street financiers who helped ruin the economy in 2008, and advocating the same tax policies that the Republican neoliberal elites have been trying to achieve for decades. His plans complete the redistribution of income upwards that has been going on since 1980, as the programs and tax policies that built the middle class mid-century are abandoned in favor of the laissez-faire economics that prevailed before the Depression. His claims that he wants to reclaim the prosperity of the postwar era are ersatz nonsense, of course. His plans for infrastructure investment are basically giveaways to private capital; these will not slow the decline of the American working class but will instead benefit wealthy communities and continue to privatize public roads and bridges. The biggest lie Trump told in the Rose Garden, just a few days before the 73rd anniversary of D-Day, is that Americans are not threatened by climate change. Like the America Firsters before him, he wants us to believe that America can be great by ignoring the moral and existential imperatives of our time. Every nation in the world — excepting Syria and Nicaragua — is in the Paris Accord, and this is because the dire effects of climate change do not respect national boundaries. A risk to all is shared by all, and the solution must be collective as well. Trump’s isolationism is essentially a denial of this shared vulnerability, and shared responsibility. It is a pose he shares with most Republicans but with nobody else (no other political party in the world denies the imminent peril of global climate change). 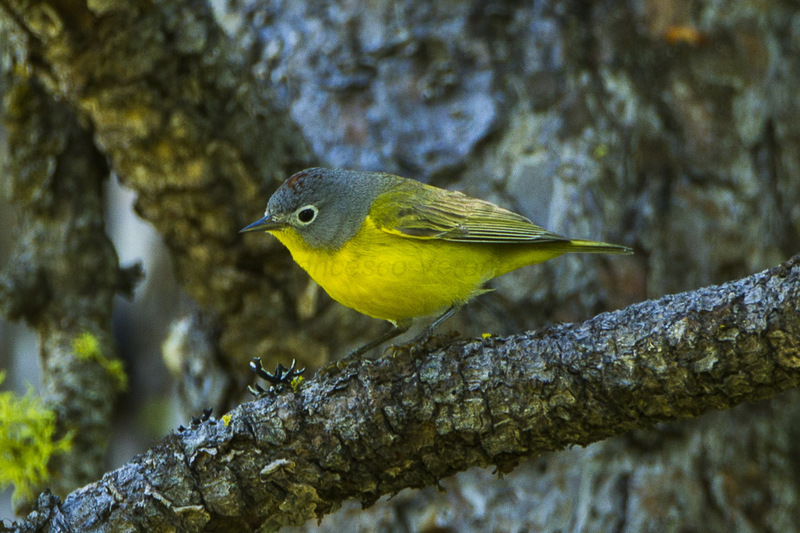 A Nashville warbler considers his next move. Photo Francesco Veronesi. May 12, 2017. 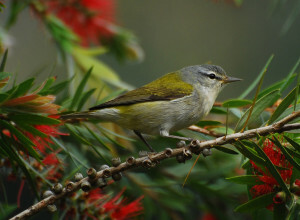 Last weekend I predicted a warbler wave would arrive Tuesday morning. It did. All around when I stepped outside were the flitting forms of tiny songbirds who had traveled hundreds of miles in the night, taking advantage of a brief uptick in wind speed at their backs as they surged northward. They’d arrived on the Gulf Coast a week before, to rest and fatten up a bit, then took the next big jump to their breeding grounds…and landed here for the moment. Within earshot were a least flycatcher (a deep forest-dweller), the ethereal-voiced Swainson’s thrush of the boreal forest, and lots of Nashville warblers, pictured above. It lives nowhere near Nashville. It just happened to be first described and named by Alexander Wilson, the less-well-known bird-artist competitor of John James Audubon, while he was in Nashville. 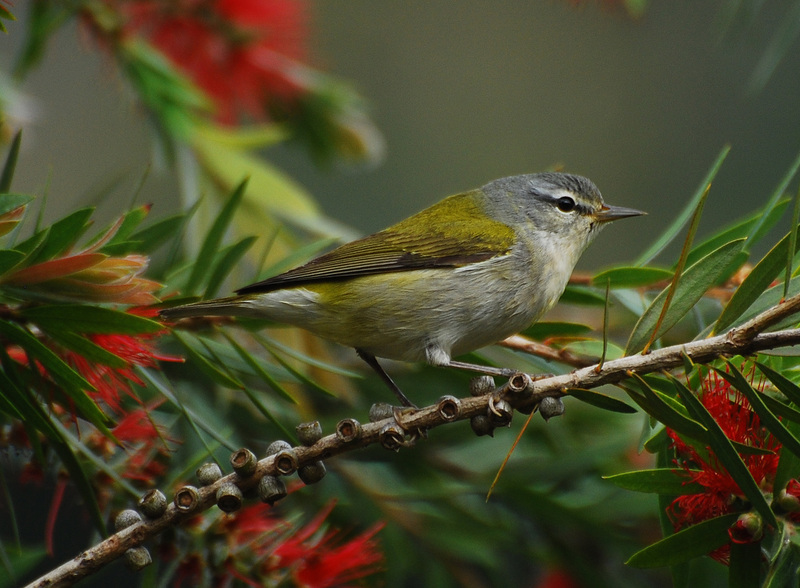 I’d read the tea leaves–pages of my phenology journals, actually–and correctly predicted the date when the first wave of migrating birds from the tropics would arrive.